At that moment, throughout the land, there was a great feeling of peace and happiness. People forgot their troubles, ceased their quarrels and felt great love. and friendship for one another. Some people saw rainbows suddenly and unusual things were seen.Wise men from all over the kingdom noticed these signs of peace and joy and excitedly said to each other, "Something very fortunate has just happened. Look at all these wonderful signs! Today is the full moon day of the fourth month. It must certainly be a special day! "Queen Maya, unaware that her joy at having a son was being shared at that very moment throughout the kingdom, took the new-born baby in her arms and returned to the palace of the King.With great rejoicing, King Shuddhodana greeted his Queen and his new son. Splendid festivals were held and the whole kingdom was decked in beautifully colored banners. It was a time of great happiness and peace. There was so much gladness everywhere that his parents decided to name the Prince "Siddhartha", which means "the one who has brought about all good ".Now the wise men made new predictions about the baby. "O King," they said, "the signs of the Prince's birth are most favorable. Your son will grow up to be even greater than you are now!" This news made the King very proud. 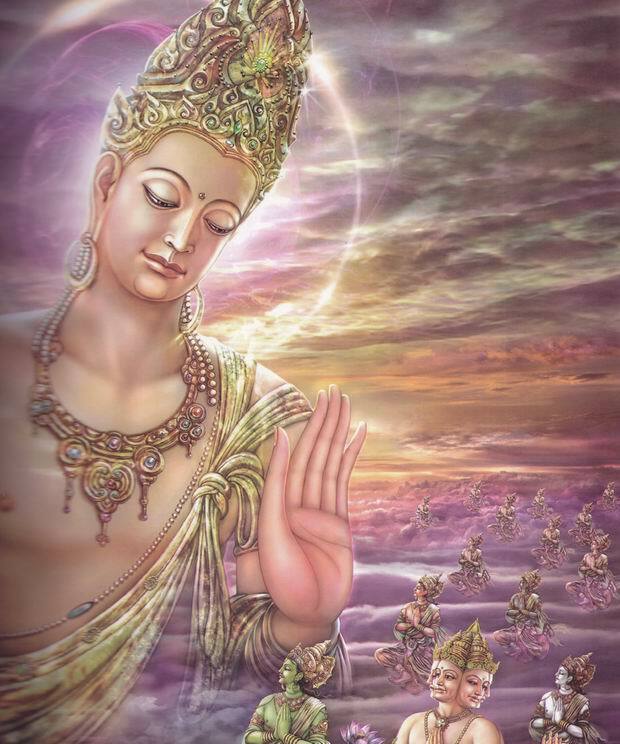 "If these wise men are correct," he thought, "my son, Prince Siddhartha, may one day be the ruler not only of my small kingdom, but perhaps of the entire world! what a great honors for me and my family ! "In the first few days after his birth, many people came to the palace to see the new baby. One of these visitors was and old man named Asita. Asita was a hermit who lived by himself in the distant forests, and he was known to be a very holy person. The King and Queen were Surprised that Asita would leave his forest home and appear at their court, "We are very honored that you have come to visit us, O holy teacher," They said with great respect. "Please tell us the purpose of your journey and we shall serve you in any way we can. "Asita answered them, "I thank you for your kind welcome. I have come a great distance to visit you because of the wonderful signs I have recently seen. They tell me that the son recently born to you will gain great spiritual knowledge for the benefit of all people. Since I have spent my entire life trying to gain such holy wisdom, I came here as quickly as possible to see him for myself. "The King was very excited and hurried to where the baby Prince lay sleeping. He carefully picked up his son and brought him back to Asita. For a long time the holy man gazed at the infant, saying nothing. Then he finally stepped back, looked sadly up at the sky, sighed heavily and began to cry. Seeing Asita weep, the King and Queen became very frightened. They were afraid that the holy man had seen something wrong with their child. With tears in his eyes, the King fell to his knees and cried out, "O holy teacher, what have you seen that makes you weep? Didn't you and all the other wise men say that my son was born to be a great man, to gain supreme knowledge? But now, when you look at my baby you cry. Does this mean that the Prince will die soon? Or will something else very terrible happen to him? He is my only child and I love him dearly. Please tell me quickly what you have seen for my heart is shaking with sadness and fear. "Then with a very kind look, Asita calmed the new parents and told them not to worry. "Do not be upset," he told them. "I am not crying because of something bad I saw for the Prince. In fact, now that I have seen your son, I know for certain that he will grow up to be more than just a great man. There are special signs that I have seen on this child-such as the light that shines from his fingers-that tell me he will have glorious future. "If your son decides to stay with you and become a king, he will be the greatest king in history. He rule a vast realm and bring his people much peace and happiness. But if he decides not to become a king, his future will be even greater! He will become a great teacher, showing all people how to live with peace and love in their hearts. Seeing the sadness in the world he will leave your palace and discover a way to end all suffering. Then he will teach this way to whoever will listen. "No, dear King and Queen, I was not crying for the child. I was crying for myself. You see, I have spent my whole life looking for the truth, searching for a way to end all suffering. And today I have met the child who will someday teach everything I have wanted to learn. But by the time he is old enough to teach, I shall already have died. Thus, I shall not be able to learn from him in this life. That is why I am so sad. But you, O fortunate parents, should not be sad. Rejoiced that you have such a wonderful child." Then Asita took one long, last look at the child, and slowly left the palace. The King watched him leave and then turned towards his son. He was very happy that there was no danger to the Prince's life. 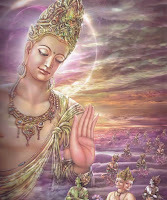 He thought, "Asita has said that Siddhartha will become either a great king or a great teacher. It would be much better if first he became a king. How proud I would be to have such a famous and powerful son! then, when he is an old man like Asita, he can become a holy man if he wants. "So, thinking like this, King Shuddhodana stood happily with his baby in his arms, dreaming of the fame that his son would someday have. No Response to "A Holy Man's Visit"